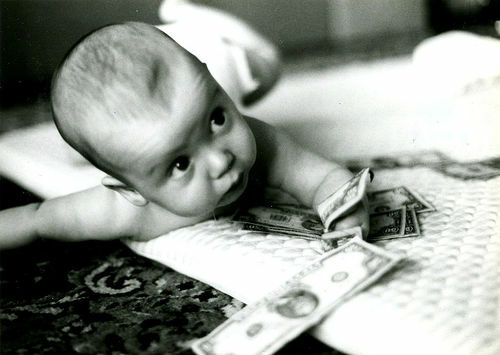 future net tax contributions of their children are taken into account. (discounting future contributions at an annual rate of 3 percent). This seems like a very strange argument. Yes, the children will pay taxes when they are adults, and are themselves using the roads, bridges, social services, etc. those taxes help to pay for. Why do their parents get credit? I read this, and also was a bit perplexed. But, what I think what it boils down to is a generational transfer — the next generation transfers wealth to the previous generation, including those who did not reproduce in the previous generation. Children support the elderly, after they’ve grown up. In the olden days, this would have been a direct benefit of reproducing — your children would support you. Now, with social security and other forms of benefits, children help support the elderly in general, rather than just their parents. That means all elderly people benefit from the output of other people’s children. People with children also benefit from group benefits, but they also invest unpaid labor and unreimbursed expenses in the production of the child, who later contributes generally to the support of the elderly. Now, what I still don’t understand is whether this is a steady state solution — it could be. Parents support children, grown up children support the elderly. When we were caring for my wife’s dad in his final illness – this included quite a lot of bodily fluids – our #2 son asked, ‘are we going to have to do this for you, when you get old?’ and we said YES! Childless people had better be damned grateful to us breeders when they are old and need someone to wipe their butts. What if you are infertile? It’s scary taking care of your parents in their old age, dealing with the medical system and wondering who will do this for you? Chiming in as devil’s advocate — but if we’re assigning the cost/benefit of kids back to their parents, what happens if your child turns out to be incarcerated? Or unable to work/pay taxes because of disability? American has many problems, but they do not include a lack of willing and able people who want to move here and work hard. I love my girls, and think they will be great, productive Americans one day, but I don’t see why tax policy should favor them over — say — willing, able, and productive Mexicans, Indians, and South Koreans who would be willing to emigrate and do the jobs my daughters will one day get instead of foreigners who want to come in and steal their jobs. As long as America remains a great country where skilled workers want to come to work, I don’t see an advantage to using tax policy to promote native-born babies. I’d be having mine anyway, and if people are only having them because of the tax benefits, I’d be happy use replacements instead. But the point is I don’t get the tax issue. I am now – very happily, I might add – paying taxes to educate these kids. I’m also supporting the elderly with my taxes – also very happily. It doesn’t make sense for parents to get credit for the next generation’s taxes. If we were facing a declining population, then okay, that should be factored in, but that doesn’t seem to be in the offing either.